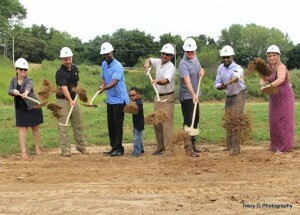 KANSAS CITY, Kan. –KCK RBI will be breaking ground on a new baseball field Tuesday. Cle Ross bought the old field near 53rd and Parallel Parkway in 2008 and the KCK RBI program began two years later with 300 kids and has since tripled in size. Currently the field is overrun with brush, the bleachers are about the fall down, the outfield isn’t level and the lights don’t work. The new field will be named after George and Doril Haley. George was the first black senator in Kansas. KCK RBI is currently the only MLB sponsored little league program in Kansas. RBI stands for “reviving baseball in the inner city.” The project cost nearly $1.2 million to complete. The money for the project came from donations from the Royals and Major League Baseball.